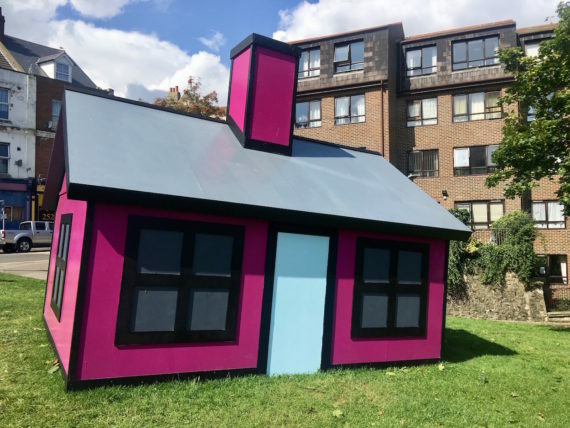 For the Folkestone Triennial, London-based artist Richard Woods has created a series of six cartoon bungalows around the Kent coastal town, each painted in different vibrant colours and placed in improbable settings. He explains why to Fisun Güner. 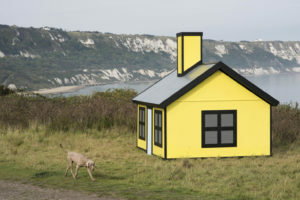 Richard Woods is one of 20 contemporary artists commissioned for this year’s Folkestone Triennial. 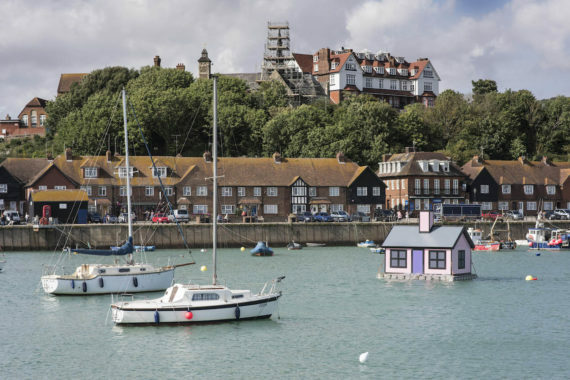 He has installed six cartoon bungalows around the Kent coastal town, each one painted in different vibrant colours, and each installed in an improbable place: one Holiday Home can be found moored in the harbour, another is apparently sinking into the pebbles on the beach. Woods, who lives in London, has always been interested in design and in the process of making. As well as constructing imitation homes, you can find him simulating the textures and surfaces to be found around the home, covering walls and floors and furniture with his signature fake and decidedly cartoonish wood grain effect designs. He has also cladded buildings with his striking, often incongruous ‘logos’ of fake bricks or Tudor beams. At the commercial end of his practice, Woods has collaborated with the furniture manufacturers Established & Sons, resurfacing a range of furniture with his multi-coloured wood grain effects. He has also designed an interior for the Comme des Garçons’ store in Osaka, covered a private residence in New York with mock Tudor, and transformed the interior of Cary Grant’s one-time Hollywood residence for its owner, Jeffrey Deitch, former director of the Museum of Contemporary Art, Los Angeles. 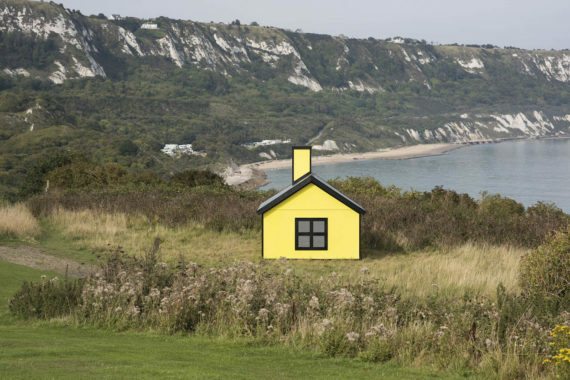 Your bungalows for this year’s Folkestone Triennial can hardly be missed – their presence dominates the town. What gave you the idea for them? 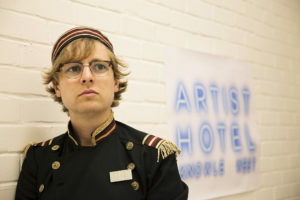 I had arranged to meet Lewis Biggs, the curator of the triennial in Folkestone, and have a walk around the town. I was handed a piece of paper as I walked up the high street that asked me if wanted to sell my house for cash, as houses in the area are becoming very desirable as second homes. The offer of ‘cash for my home’ made me think about where would be the most desirable place to have a holiday home and about what would happen to the people who sell up and move out. I guess housing is such a big subject generally. I found myself thinking about wealth distribution and immigration, and turning myself into a ‘property developer’ for the summer seemed to be an interesting way to make a work that tapped into these issues. Why are the Holiday Home bungalows one-third the size of a typical bungalow? 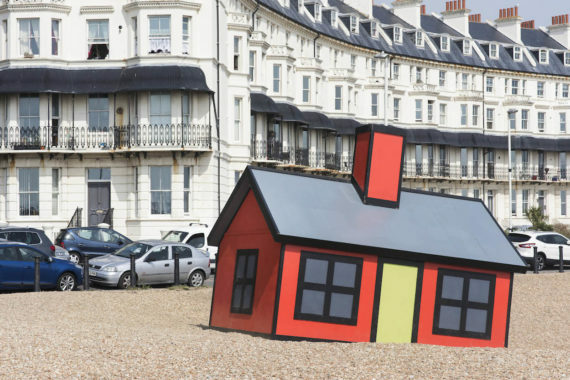 We came up with a size that was bigger than a beach hut, but smaller than a real house. It was important that sculptures were architectural in feel and not like architectural models, but also I always knew I wanted to make multiple houses so the viewer could compare the sites, and so the budget came into that process. If the houses had been twice as big we’d only have been able to make two of them. Has the housing economy concerned you in any of your previous work, or was this very specific to the project at hand? I hope my work has always reflected my interests in home renovation, DIY culture and notions of taste. And in turn how all those things reflect our national obsession with class and status. Maybe housing, or the lack of it, has become a sharper issue. It’s a subject that permeates almost every part of our lives. Were there any challenges that confronted you when making and installing Holiday Home? We constructed the houses over a month-long period on the harbour arm in Folkestone. Making artwork in public and in the outdoors is always a challenge. The weather can surprise you, as can the public. I think we got a real sense very early on about what a topical issue housing was. As the holiday homes took on more and more of a house shape, we got more and more people wanting to ask about the project and chat about the housing issues within the town. This was great, apart from it somewhat slowing our building progress down. You used to work mainly in black and white, but now your colours are incredibly bold. I mean, you can see each bungalow from quite a distance, simply because they’re so bright. What motivated that shift? I’ve always be keen on black lines. And it’s the black line [around the colour] that makes my work into a cartoon. The cartoon aesthetic allows my work to physically sit with the real world whilst being visually separated from it. You built your own home and studio in Bethnal Green in 2014. This was clearly an ambitious undertaking. Was the building design very much your own? We worked very closely with dRMM architects. 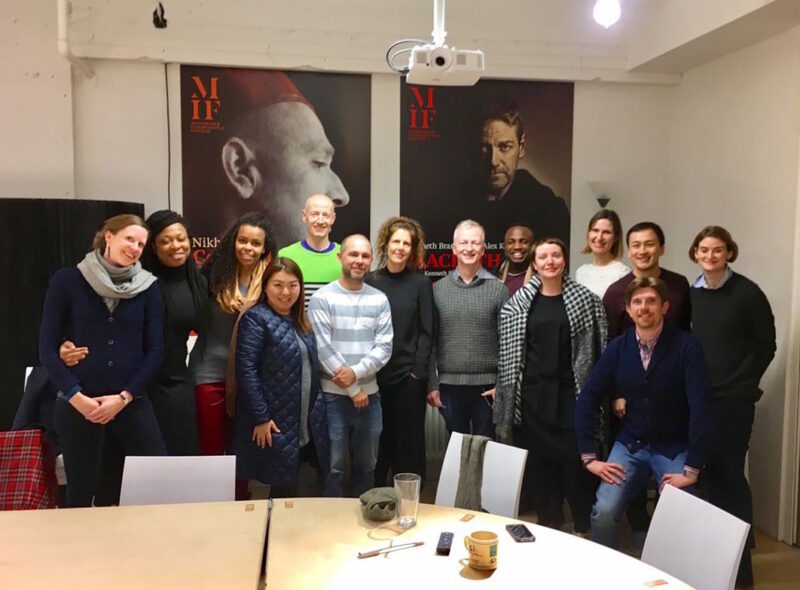 All the best ideas in the building came from Alex de Rijke, the director of dRMM architects. We chipped in ideas, but it’s very much a dRMM building. It was a massive undertaking. We had a tiny budget. I guess I wanted to bring the studio and my living space together under one roof, which was partly a financial necessity and partly a practical thing. I have three children and I sometimes need to be around to boil soup or toast things. So the design really was led by the need for studio and house to be combined. Then the budget also led to many of the design and architectural decisions. Was this ambitious undertaking much as you expected it to be? The house is made solely from wood and this made financing the project very difficult and expensive. The most exhausting part of the project was trying to persuade the businesses who lend money, to lend money on a building that is an original design. Building sustainable houses is easy, it’s lending money to build sustainable houses that takes time. My next project is another public artwork. It’s being commissioned by Eastside Projects in Birmingham and Banbury council. We’re making tiny replica houses – the shape and style copies a new housing estate which is being built very nearby – and then placing them in nearby trees. I like to think the artwork is giving the replica housing estate the best back garden that it could ever wish for.